Fourteen years after Shearwater Research was founded in a spare bedroom, the Canadian manufacturer has debuted their inaugural watch dive computer. The 'Teric'. The naming of dive equipment has always fascinated me. Frankly I can't get that excited over what appears to be a random spoonful of Alphabetti Spaghetti seasoned with a couple of odd numbers thrown in for good measure. I do however become intrigued when the product has a proper name and how that came about. In 2014 KISS Rebreathers asked me to suggest a suitable moniker for their emergency bailout sidemount rebreather. I came up with 'Sheppard' and the name and the reasons were liked. Jack Sheppard was a pioneering British cave explorer and diver and one of the first men in the World to make a cave dive in the mid 1930s. It seemed a fitting tribute to Sheppard because he helped develop new techniques and special equipment for cave diving. Secondly the very nature of bailing out can be quite a stressful situation. Especially when you are doing extreme exploration or diving. A shepherd protects, guides and escorts their charges to safety, and this is exactly what the rebreather does. When news about the 'Teric' came across my desk, I had to ask why this everyday time piece had seemingly broken the Shearwater tradition of wrist worn computers having a name starting with 'p'. Teric is derived from the word Pteric, as in Pterodactyl or Pterosaur. The word Pteric means “of, relating to, or resembling a wing”. Shearwater understandably removed the silent 'p' to stop the mispronunciation of Pteric. 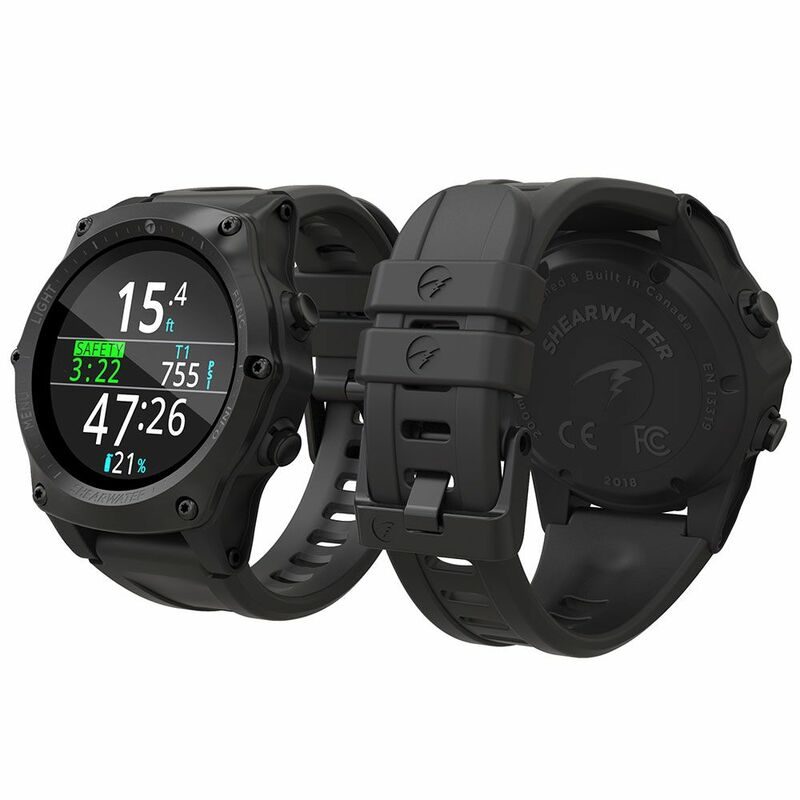 Shearwater Research state that "the Teric is an everyday time piece that comes loaded with all the capabilities divers have come to expect from Shearwater and much more." This compact mulit-gas trimix computer has easy and intuitive menus and a full colour AMOLED screen with a highly visible, bright and vivid display. It can be used by both scuba and rebreather divers and has a fixed PP02. Other features include free diving mode (with programmable sampling rates), a tilt compensated 3D compass and a rechargeable battery. The Teric has been designed so that its firmware can be upgraded by Bluetooth. It is also fully integrated with the free Shearwater Cloud multi-platform dive logging service.